2019 Summer School registration opens April 1, 2019 at 8:00 a.m.
*Please note: Math and English courses may be taken only as make-up courses resulting from a failure during the regular school year. Math and English courses cannot be taken for advancement purposes. CHS 2019 summer classes begin on June 3 and end on July 2. Classes are Monday through Thursday from 7:30 a.m. to 11:00 a.m. and 11:30 a.m. to 3:00 p.m. Daily attendance is critical due to the condensed format of the program, which means students can miss only two (2) days. Students may take up to two classes (.5 credit each). The registration fee for each class is $100.00. There is a tuition fee of $50.00 for out-of-district students. The tuition fee is applicable regardless of the number of credits for which an out-of-district student registers. The tuition fee is in addition to the appropriate instructional fee. 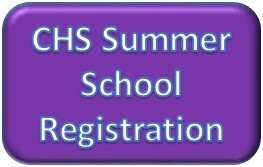 Registration for CHS summer classes closes on Friday May 17, 2019. Collinsville High School accepts registration on a first-come, first-served basis. Registration is complete only when all registration forms and payment have been received. Only students with complete registration will be added to a class roster. Minimum enrollment for all courses is 16 students. In case of cancellation, registration fees will be returned. Those students who register for a class that is cancelled due to low enrollment may choose to be reimbursed or to enroll in another class after the May 17 registration deadline, if space is still available. Please be advised that we do not offer bus transportation during summer school. Students may park on campus at no cost. There is no meal service during Summer School. Students attending a full day (both sessions) need to bring their lunch. For questions regarding CHS Summer School, please contact the CHS Counseling Department: (618) 346-6320 ext. 1129. Office hours are 7:15 a.m. to 3:30 p.m. Private school high school students, and CHS students who qualify, may register to take Driver’s Education during the summer. Driver’s Ed is available at a cost of $250.00 and is arranged by Driver’s Education Coordinator Mrs. Cara Gresh. She can be reached at 618-346-6320 ext. 1117 or driversed@cusd.kahoks.org. Registration and payment for Summer School Driver’s Education are handled through the 2019 Summer School link. Click HERE or use the Quick Link on the CHS webpage under INFORMATION on the right side of the screen. You will be directed to the Summer School Web Store. If you do not already have a login from previously paying fees to CUSD 10, you will need to create an account. Follow the steps to complete the registration and payment process. The registration site also includes a registration and payment tutorial document for your assistance.